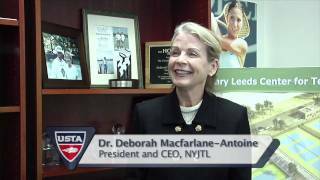 NYJTL is now a CTLE Sponsor. Any teacher who attends a School-Time Tennis Program (STP) training as of January 2018, will receive 6.5 CTLE hours. At the conclusion of training, each participant receives a set of new rackets and balls to be utilized at their respective school. Teachers are provided with lesson links as well as an online recreational coaches’ guide, that contains development plans for children at the early stages of tennis learning. A raffle is also held with the winner receiving a number of portable mini-nets for indoor usage (perfect for gymnasiums). In addition, upon request, we will send experienced NYJTL tennis coaches for FREE to help with implementing the tennis unit during the school day. Traditionally 6 trainings are scheduled every year and they are held at the Cary Leeds Center for Tennis & Learning in the Bronx, with the exception of the last training. Trainings will run from 8:30am-3pm with time set aside for lunch. Lunch will be provided by NYJTL. To learn more, please contact Scott Daly at tc@nyjtl.org or Alejandra Basaldua at ang@nyjtl.org or 347-417-8125. To sign up for our free training, register through this Google Form or fill out this application and fax/scan back to us.